I've had Botox. I'm happy to admit it. And I've not just had it once—I've had it four times in the last four years. It works brilliantly to erase wrinkles in as little as 10 days, and it lasts for months. The thing is that not everyone wants to inject their face with a toxin (because that's essentially what it is). So what can you do instead? We called on Inge Theron, founder of FaceGym—known as the "only gym studio for your face"—to give us a lesson on how to train our facial muscles at home. There are 40+ muscles in our faces, and if we keep them in shape (think strong and supple), we can stave off wrinkles and sagging for longer, and even perk up a dull-looking complexion. Theron has shared five exercises you can do daily; keep scrolling to explore the world of everything from cheek burpees (yep, they're a thing) to face yoga. Muscle Worked: Masseter. This muscle enables us to chew; it's also the one that aids teeth grinding and jaw clenching when we're stressed. To relax the muscles, try some cheek burpees—these are a great warm-up for the face, and they're far less taxing that actual full-body burpees. Do This: Place a clean right thumb into your mouth on the left side. Pinch your cheek with thumb and first finger. Press until you feel any pain/soreness. Hold for a count of 10. Pull your cheek out towards your ears; pull down, back to the teeth, and then back up. Rotate your cheek in a complete circle three times. When released, your cheek should feel lighter. Repeat on the other side. Muscle Worked: Platysma (otherwise known as the turkey-neck muscle). By strengthening this, you'll prevent gravity from creating the look of a double chin. Do This: Bring the corners of your mouth downwards and you will feel the platysma pop out. Hold for 10 seconds, and release. Repeat as desired. Do this for a maximum of 10 times, as this muscle can fatigue quickly. Muscle Worked: Obicularis oculi. The muscles you'll be working here are the ones responsible for opening and closing your eyes. If crow's feet are your issue, this is the exercise to do. Do This: Hold the corner of the eye contour (by your temple) to isolate the muscle. Blink from the bottom corner of the eye and you will feel it flutter. Repeat 10 times. Muscle Worked: Zygomaticus. You are targeting your "smile muscles" here to give the apples of your cheeks a boost. Do This: Curl up the mouth corners and smile; stagger this motion so you're doing it in three moves. Release in three moves. Repeat 10 times. Muscles Worked: Frontalis, procerus, corrugator, nasalis. These facial muscles work to raise the brows, which causes wrinkling of the forehead and also to draw the brow down in a frowning motion. Do This: To erase forehead wrinkles over time, rest the heel of your hands on your forehead and the top of your brows. Hold the forehead firmly with your hands facing upwards. Try to frown and pull brows down. Repeat 10 times. This exercise also strengthens the occipitalis muscle, which will lift the whole face and scalp over time. Want to accelerate the results? 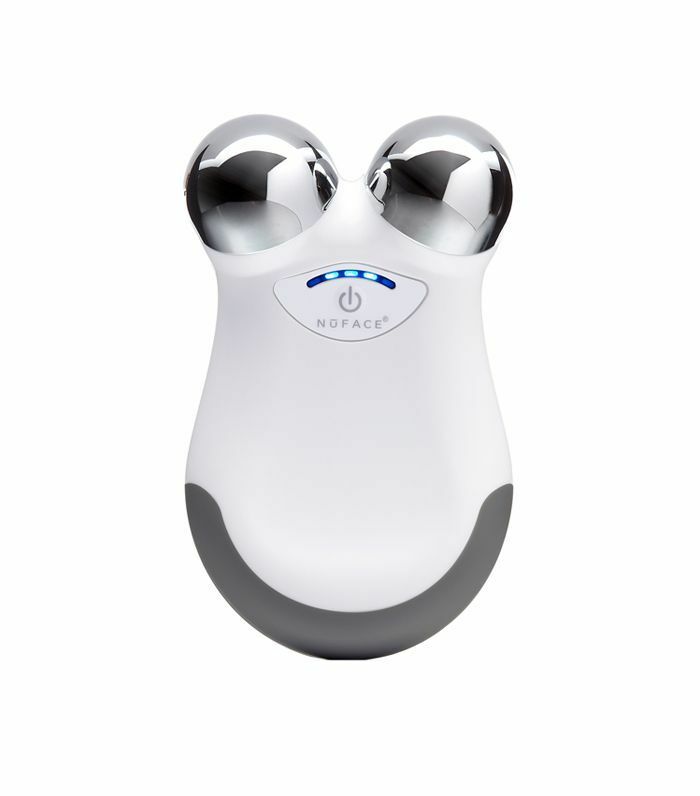 There are gadgets that use massage, electrical currents and/or vibrations that do the hard work for you. Keep scrolling to shop this face-lifting tech below. Next up, check out our review of the Nurse Jame UpLift Facial Massaging Beauty Roller.